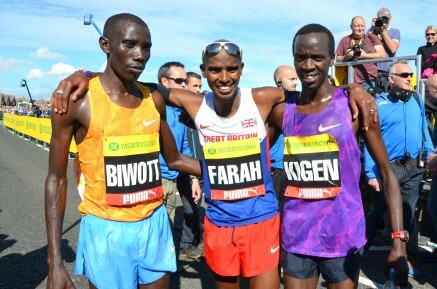 13th September 2015 – Just two weeks after defending both of his World track titles Mo Farah (GBR) successfully defended his Great North Run title. Once again he was made to work hard for his win as Stanley Biwott (KEN) tested him over the final few miles, throwing in surges and weaving across the road in an attempt to drop him. Mo was able to track Biwott though and after a little surge of his own down the steep decline with a just over a mile remaining was finally able to overhaul Biwott in the last 300m to cross the line in a new personal best time of 59:22. PACE athletes packed well behind Mo’s lead as Mike Kigen (KEN) took third in 60:10, Thomas Ayeko (UGA) fifth in 61:14, Mark Kiptoo (KEN) eighth in 62:32 and Timothy Toroitich (UGA) tenth in 63:14. The previous day at the Great North City Games Selah Busienei (KEN) completed a busy week which saw her compete in three races. She followed a third place over 1500m in Amsterdam and a second place in a personal best over 3000m in Zagreb, with a second place over 2 miles. Steph Twell (GBR) was sixth. Tom Lancashire finished a busy 24 hours by taking third place in the mens mile having finished fourth over 1500m at the IAAF Diamond League in Brussels the previous evening. Also in Brussels Shannon Rowbury (USA) ran her second fastest ever mile to take third place and Galen Rupp (USA) finished tenth in the 5000m. Straight from Brussels Shannon flew back to the US to round out her season on the roads of New York as she raced at city’s famous Fifth Avenue mile. Here she took second place while Matthew Centrowitz (USA) also closed out his season with fourth in the mens event. Finally at the IAAF World Challenge meeting in Rieti Vincent Kibet (KEN) took second place over 1500m and at the Copenhagen half-marathon Emmanuel Bett (KEN) was eighth.